Oops, wrong super-hero. Read on…. Motor Man and I have met some interesting folks through our involvement with racing. One of those is Larry “Spiderman” McBride. 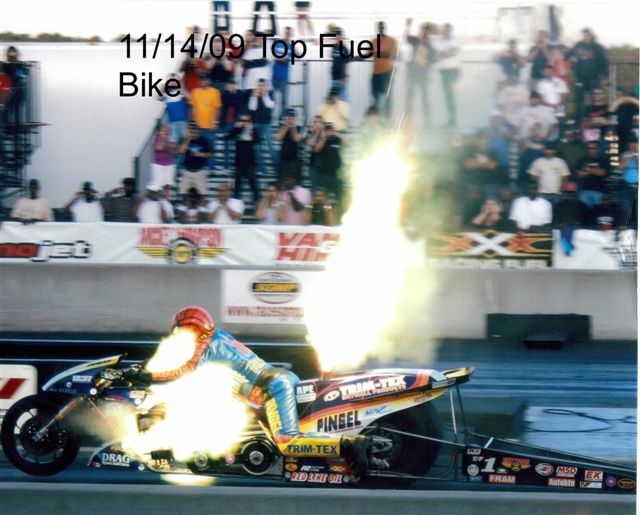 Larry races a top fuel bike (motorcycle), and is known as “the fastest man on two wheels”. He was the “first in the fives”, meaning he was the first person to drive a bike down a quarter mile track in the five second bracket. This is an image I found online of Larry on his bike. I never knew until recently how he got the nickname “Spiderman”. 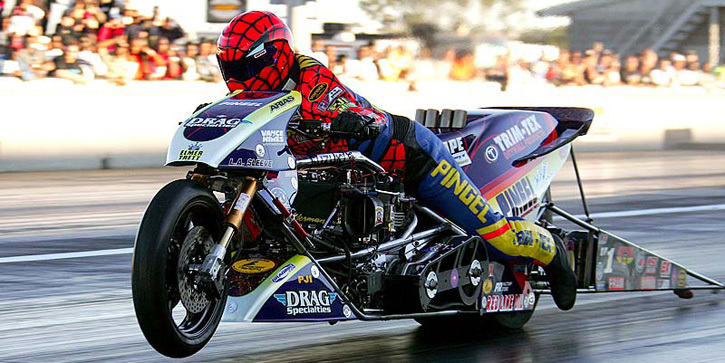 It began in 1980 when a race announcer commented that the way Larry crawled around on the bike reminded him of Spiderman. Larry operates a motorcycle performance shop about a half hour from us, so we drop in to see him occasionally. Sometimes he needs my advice when he’s working on his bike. 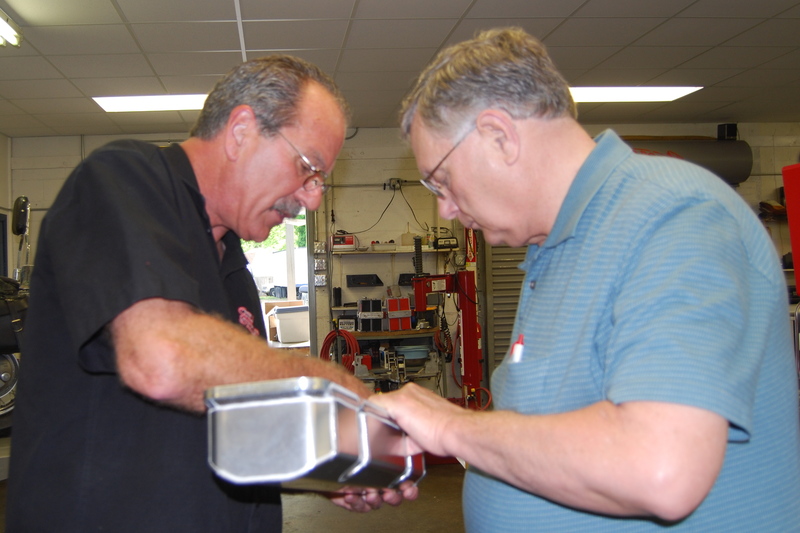 Two motor men: Larry builds motorcycle engines, and my Motor Man builds race car and race boat engines. If either of them needs help from the other, that help is just a phone call away. And you can bet that when my nephew, Connor, is in town, a stop at Spiderman’s shop is a must. Larry always has time to visit with us and autograph something for Connor. 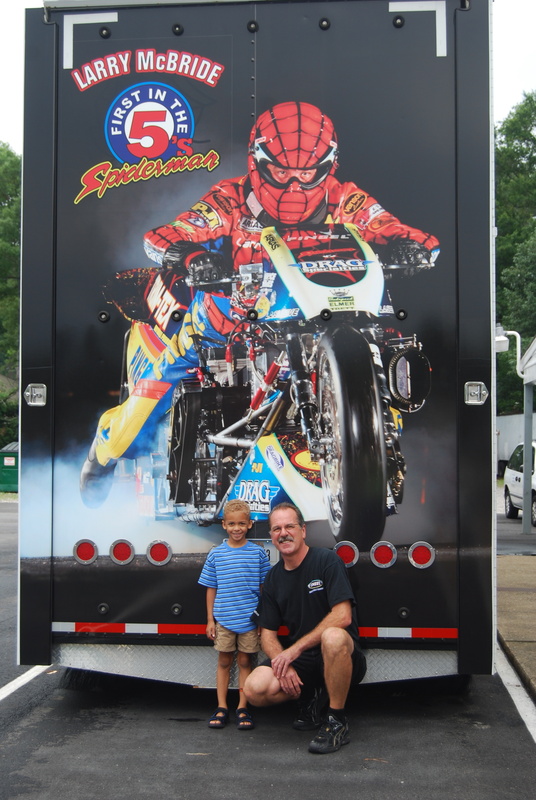 This is the back of the Spiderman hauler. If you come up behind this on the highway, you know there’s a very fast bike inside. I cannot imagine riding a motorcycle that fast. And I really cannot imagine dealing with this. Larry experienced a fire at a race in Valdosta, Georgia in November, 2008, but thanks to all his safety equipment, he wasn’t injured. He sent this picture to me soon after that race. Yes, Larry McBride is one of the more interesting people we’ve met through racing. He’s also one of the nicest. You can read more about Spiderman on his web-site, which can be found here. And tell him if he needs any help with the bike, just give me a call.